Call him the 'Father of the nation' or Bapu or Mahatma, Gandhi continues to reign in hearts of millions of people because of his significant contributions towards humanity. October 2nd marks Mahatma Gandhi's birthday when the world remebers him for his noble teachings and persuasive methods of non-violence. His struggles to attain freedom from the shackles of British rule and his dream to see an independent country became true on 15th August, 1947 with the help of his most effective weapon non-violence. On his 147th birth anniversary, let us reminisce about the great soul and take a look at some of the films made on Bapu's life and principles. Gandhi (1982): Directed by Richard Attenborough and starring Ben Kingsley as Mahatma Gandhi, the film is based on the memoirs of Gandhiji. The film traces Gandhi’s life from 1893 when he was thrown off a South African train for being in a whites-only compartment, to the epic Satyagraha and concludes with his assassination and funeral in 1948. It features his struggles in non-violent protest campaign , Quit India movement, Non-Cooperation campaign, his occasional imprisonment, Jallianwala Bagh massacre, and Partition of India. 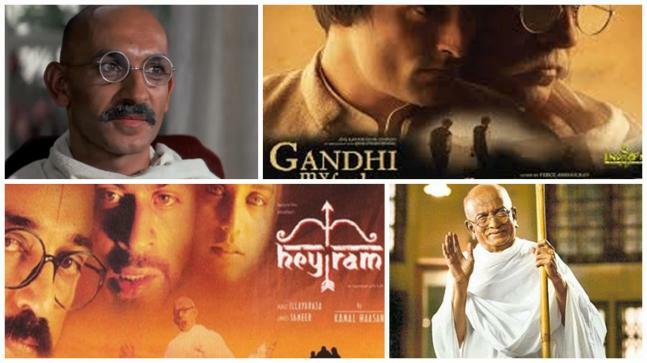 The Making of the Mahatma (1996): Directed by distinguished filmmaker Shyam Benegal, the film explores 21 years of Mahatma Gandhi especially the time spent in South Africa. The movie is based on the book, The Apprenticeship of a Mahatma, by Fatima Meer who has scripted the screenplay for the movie. Actor Rajit Kapur flawlessly portrayed the role as a young Gandhi and also won awards and accolades for the role. The movie received wide critical acclaim and won Rajit Kapur the National Best Actor Award. Gandhi, My Father (2007): The movie throws light on the troubled relationship between Mahatma Gandhi (played by Darshan Jariwala) and his son Harilal Gandhi (played by Akshay Khanna). Directed by Feroz Abbas Khan, the movie illustrates the growing rift between father-son duo that is beyond repair. The film was produced by Anil Kapoor and won high critical acclaim and was feted with jury awards. Hey Ram (2000): This film mainly focuses on India`s partition and the assassination of Mahatma Gandhi by the Hindu extremist Nathuram Godse. Gandhi is portrayed by Veteran actor Naseeruddin Shah. The writer, director and producer of the film, Kamal Haasan plays the role of Saket Ram, a Hindu fundamentalist who portrays the role of a would-be assassin of Gandhi but later on changes his mind and attempts to beg for forgiveness. Although the film could not do well at the box-office, it garnered positive response outside India. The movie was also India’s official entry to the Oscar’s in the Best Foreign Film category in 2000. Lage Raho Munna Bhai (2006): This movie is a sequel to Munna Bhai MBBS, which was directed by super hit combo of Rajkumar Hirani and Vidhu Vinod Chopra. The term 'Gandhigiri' got immensely popular through this film. Hirani disseminated Gandhiji’s teachings without making it preachy by making the mass-loving goon Munnabhai (played by Sanjay Dutt) understand the significance and effectiveness of Gandhiji’s non-violent methods even in the present day and age. The film had such a powerful impact on Indian society that it led to various peaceful protests in the name of Gandhigiri in the country as well as abroad.